Over the course of my numerous business trips out to the DC area, I'd failed to enjoy me some sushi, even once, thanks to the various dietary constraints of my traveling companions. This time, however, I made it a point to convene a like-minded group of coworkers to hit up the best sushi in the City, the choices of "best" being Makoto, Sushi Taro, or Kaz Sushi Bistro according to most diners. We obviously visited the latter selection, which isn't even necessarily a traditional sushi bar, but rather, a "bistro" of sorts that features Chef/Owner Kaz Okochi's European-inflected "freestyle Japanese cuisine." About the Chef: Kazuhiro Okochi hails from the city of Nagoya, Japan. Somewhat surprisingly, he started out studying fine art, in Oklahoma of all places, but after finishing his degree in 1982, returned home to Japan to pursue his interest in cooking at Osaka's Tsuji Culinary Institute. Here, in addition to honing his skills in Japanese cookery (including the art of sushi and even fugu preparation), Okochi was also exposed to French cuisine, which he instantly fell in love with. 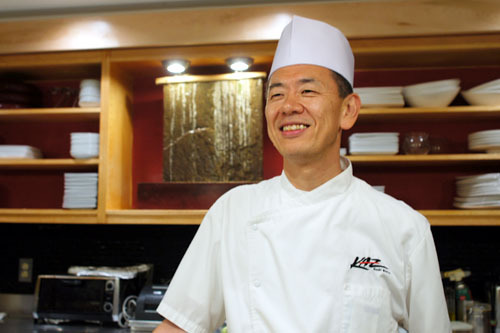 In 1988, he relocated to Washington to take up a position at Sushiko, DC's first ever sushi bar (founded 1976). During his stint there as Executive Chef, he was able to experiment with melding Western flavors with traditional Japanese cuisine. 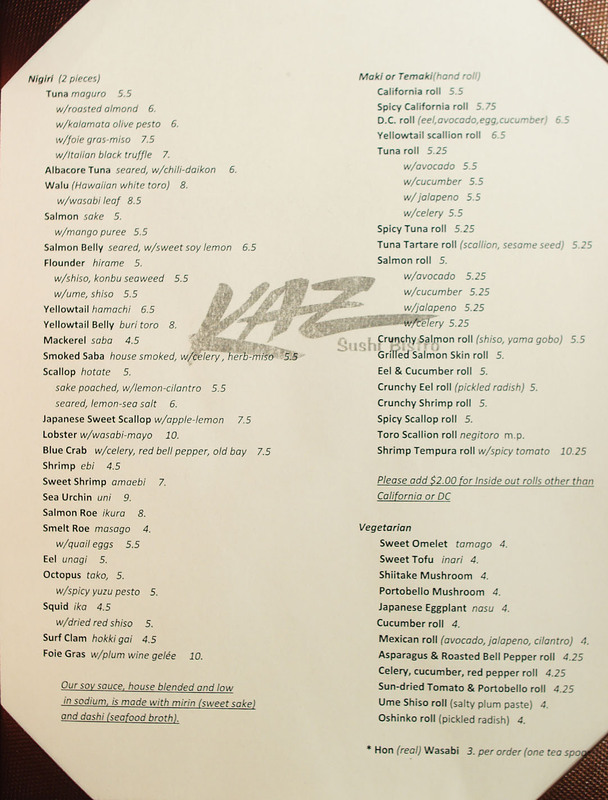 On April 14th, 1999, the Chef debuted his long-awaited first restaurant, Kaz Sushi Bistro, in Downtown DC. The eatery was a smash hit almost from the start, quickly becoming one of the City's hottest dining destinations and thrusting Okochi into the upper echelon of DC area chefs. As such, he helped kick-start the DC Chefs' Club in 2002, following the death of the legendary Jean-Louis Palladin the previous year (other members include Jeff Buben, Roberto Donna, Todd Gray, Ris Lacoste, and Michel Richard). 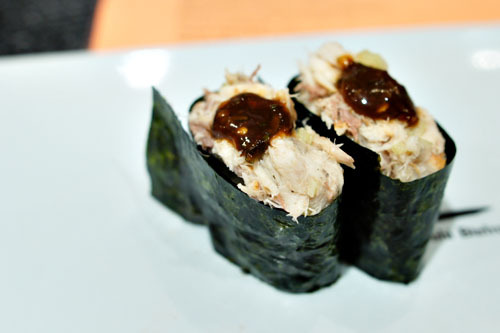 In 2009, Okochi started Masa 14, a Latin-Asian fusion restaurant opened in partnership with Richard Sandoval (of Zengo fame) and helmed by Chef de Cuisine Antonio Burrell. 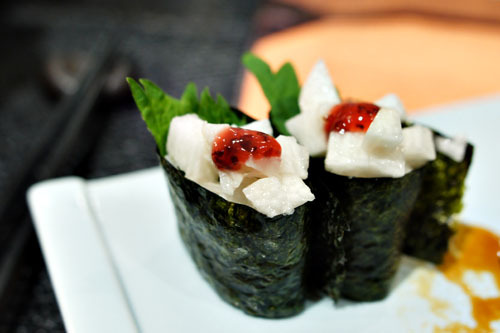 His latest venture, is Oh Fish, a casual build-your-own maki sushi place inspired by Subway (yes, seriously!). Inside, things are fairly subdued. You'll want to grab a seat right in front of Kaz at his small six-seater sushi bar. Kaz Sushi Bistro's menu features a large selection of both nigirizushi and rolls, as well as a good assortment of small plates. 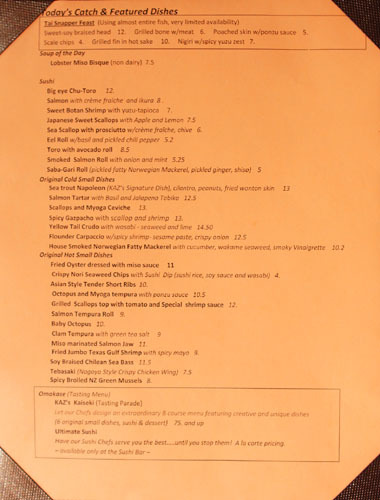 Of course, there's also an omakase option in the form of "Kaz's Kaiseki," though we opted for the "Ultimate Sushi," in which the Chef dishes out the best cuts of sushi until you beg for mercy. Click for larger versions. 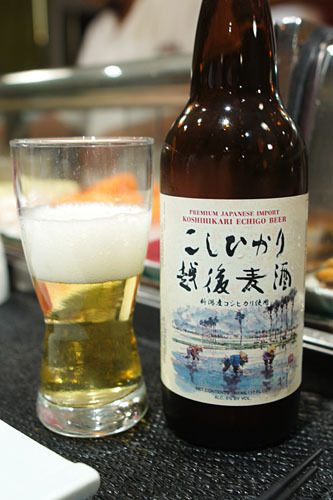 To drink, we're talking about a nice selection of sakes, a smattering of wines, beer, and various sundry items. Click for larger versions. 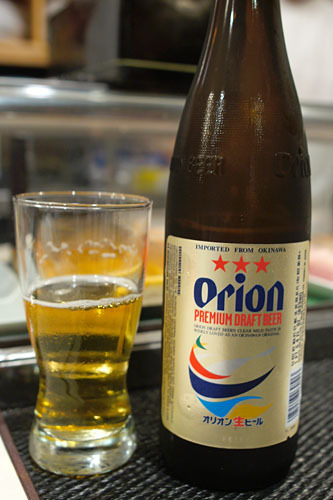 A trio of biru to begin: Orion Premium Draft [$11], Kaz Premium Red Ale [$11] (specially made for the restaurant by Echigo microbrewery in Niigata), and Echigo Koshihikari [$12]. Flounder, in two forms, greeted us as the first course. 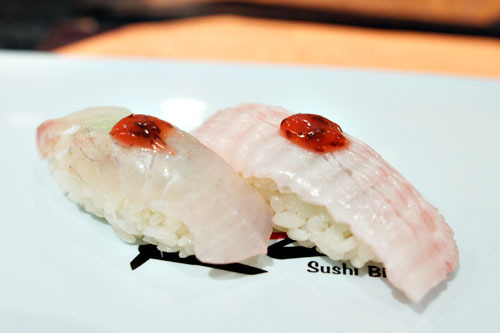 The first, on the left, was your typical cut of hirame, and showed off a delicately fishy relish that worked well with the tart, tangy, and minty notes from the ume-shiso combination. 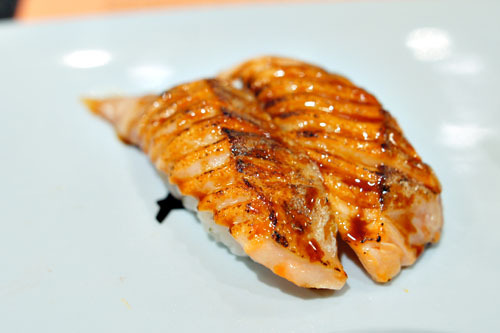 The second piece, however, was flounder fin, otherwise known as engawa, which had a much chewier consistency. 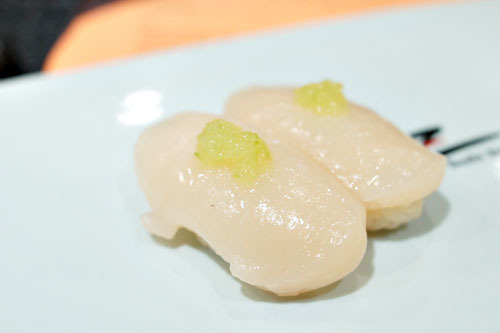 Raw Japanese scallops were paired with a commixture of apple and lemon, the tangy smack of which seemed to heighten the mollusks' inherent brine initially. The midpalate, however, more forcefully conveyed the creaminess of the hotategai, and the bite was finished with a pleasant, countervailing burn from the wasabi. Tuna, though normally a somewhat boring sushi fish, managed to be one of my favorite courses of the evening thanks to the truffle. The subtle, somewhat lush taste of the maguro actually went pretty much perfectly with the earthy, heady essence of the toryufu, which, surprisingly, didn't overpower the fish at all. 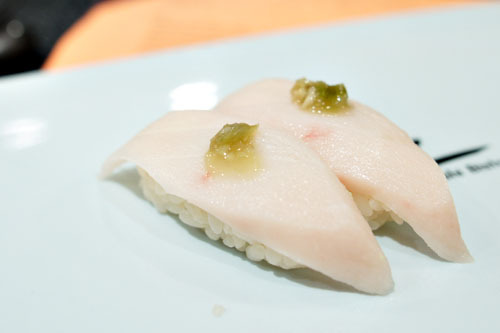 Next up was a relative rarity in the sushi scene: escolar, a.k.a. 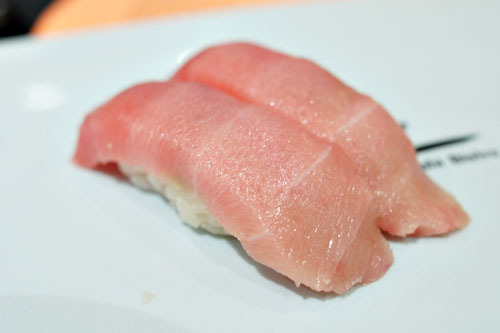 butterfish, ono, waloo, or white tuna. It was delightful, a tasty mix of creamy, sweet, and yes, buttery flavors that worked well with the slight piquancy from the wasabi leaf. Another favorite. Sweet shrimp were delectable--fresh, snappy, and wonderfully crisp. They easily stood alone, but were deftly amped up by the sour smack of the yuzu as well. Chu-toro, meanwhile, was one of the better versions that I've had. The fish was super melty and fatty, with a dare I say unctuous character and a great bit of sweetness on the close. Very nice--no accoutrements needed here. Salmon, usually a ho-hum fish, was superb too. It had a lovely creaminess to it that paired beautifully with the lush, lactic tang of the crème fraiche, while the salmon roe served to brighten up the bite a bit. 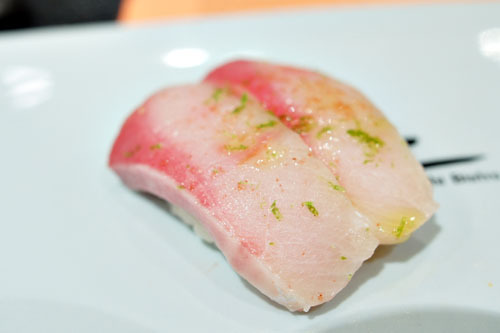 Yellowtail was nicely fatty, and kicked up a notch by the weight of the olive oil. At the same time though, the lime zest and sea salt provided sharp, offsetting flavors that balanced out the dish gorgeously. 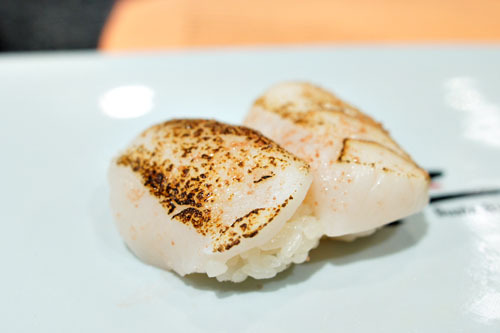 Our next preparation of scallop, meanwhile, really showed off the natural creaminess and salinity of the bivalve. I loved the tanginess of the lemon and salt combo, as well as the focused heat from the wasabi. Yum. An unconventional presentation of mackerel, one that expertly conveyed the smoky, fishy essence of the saba while moderating it with the sweetness of miso and the astringent zest of celery. Lobster was snappy, supple, and sweet, pairing perfectly with the creamy mayo all while the wasabi provided undertones of spiciness to the mix. 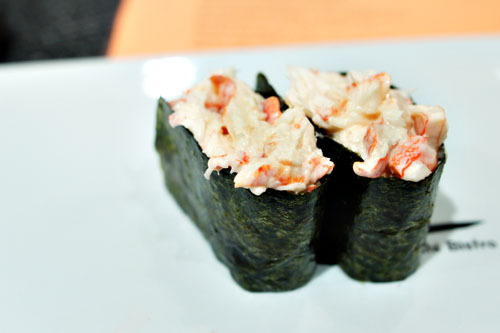 Absolutely delicious--think of it as a lobster roll in sushi form! Salmon belly was arguably the most decadent piece of sushi all night, with the palpable fattiness of the fish playing off the sugary soy, bitter char, and tangy lemon beautifully. I believe that this was the first time that I'd had foie gras in sushi form, and I'm happy to report that it worked out quite well. The plum wine gelée, fortunately, wasn't overwhelming at all, and actually paired wonderfully with the liver-y essence of the foie. A masterful variation on the classic sushi presentation of eel. I quite enjoyed how the fish was elevated by the fragrant, heady heat of the pepper and basil combination, making for an almost Thai-inspired taste. We ended our gauntlet of sushi with a version incorporating yamaimo. The mountain yam was mucilaginous in consistency, with a crisp, tangy, and slightly saccharine flavor that was nicely set off by the ume and shiso. A refreshing change of pace. 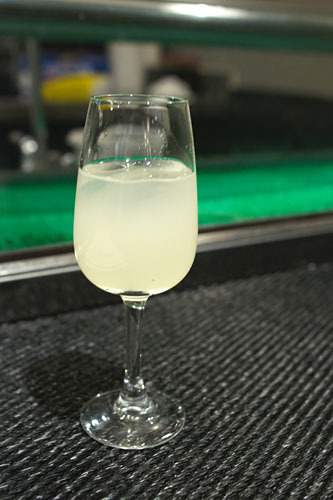 A complementary yuzu sake was provided at the end of the meal, reminding us of a Japanese version of Limoncello! It also made me think of the yuzu juice that's served as the conclusion of meals at Sushi Zo. Going in to this meal, I was a tad concerned that Okochi's use of Western flourishes would seem trite and uncalled for. Fortunately though, that was not the case. 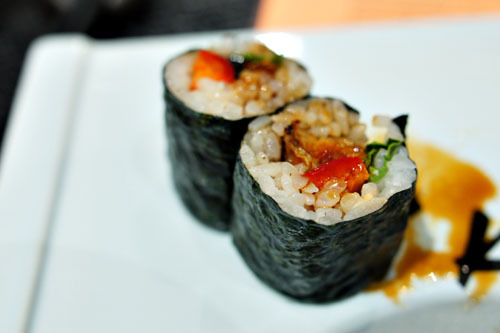 The Chef was able to elevate the classic sushi experience with his incorporation of non-traditional ingredients. The various cuts of seafood were enhanced, accented by the various accompaniments, but their inherent, natural character was never lost or overshadowed, and most importantly, the food was almost universally delicious. Best sushi in DC? I can believe it. Loved his presentation. 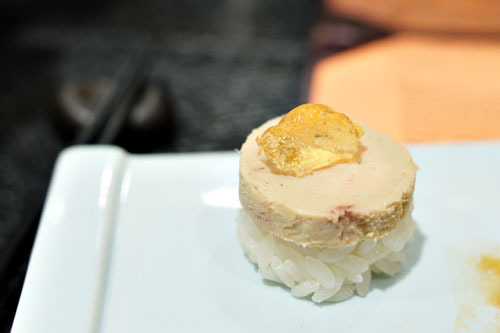 Foie Gras sushi, wow. He was missing some uni specials. Good to know next time I'm in DC, but will we be the only ones there. Where are the customers? Subdues is one way to describe it. Subdued. I need to spell check. Definitely a place to try if I go back to DC again. I like his use restrained use of flavor pairings with what would have been normal sushi. 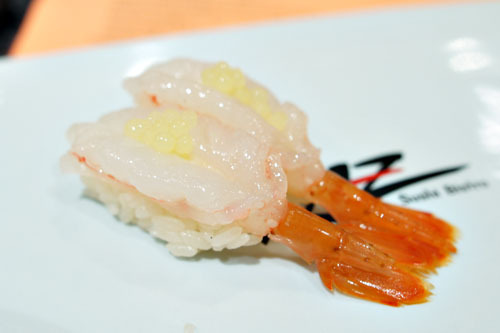 This is a perfect example of sushi evolution without the tacky fusion moniker attached to it. How creative! But how does it compare to the sushi in LA, quality-wise? Also, I wonder if the kaiseki is like Matsuhisa's, but with a French influence instead of Peruvian. I'm with Johnny, those accouterments seem to compliment rather than overwhelm. The place looks like fun and salmon belly..foie? That's just awesome. Great review. 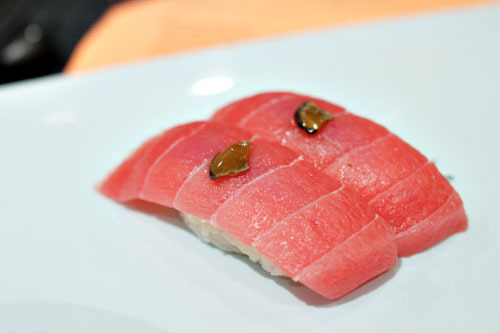 Johnny: Exactly, a great example of enhancing and augmenting the sushi experience without overwhelming or cheapening it. 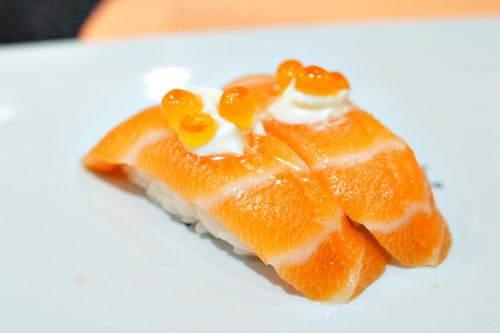 Chris: I actually think the sushi quality is right up there with the better places in SoCal. Yeah, from what I've seen, the kaiseki is in the same vein as Matsuhisa's, but with more of a French slant. Roddy: Thanks man. The food really was fun, but serious and delicious at the same time. Go for their Fugu Dinner next time. In addition to their sake tasting/pairing, they also known for their wine pairing with thier sushi omakase dinner and wine pairing with their kaiseki. I'm jealous... drooling looking at those pictures. Really digging the Foie gras Sushi. Dason: I heard about Kaz's fugu dinner, but does he still do it? I didn't see it listed anywhere. Will definitely have to consider the wine pairing next time. SP: Yeah the foie was intriguing, but actually, I'd have to rank it as one of the weaker dishes of the night (though it was still good, as was everything). he will let customer know through nesletter whenever fugu shipment come in. last year it was $150 per person with min of two person, not sure about this year through. I mean to say they are known for sake&beer paring for "sushi bar" omakase, you can also ops to add sashimi as part of your ultamate experience. Also a small warning, if you ops to go for wine paring option for kaiseki, most of the dish come out will be non-seafood base regional farm & home style cooking, most like there will be dishes you never hear off. But I can promose you that it will be fun. I'm not on his newsletter, so I probably won't be getting fugu any time soon (especially since I don't intend to visit DC for a while). $150 isn't too bad though. Yes, I know for kaiseki that the dishes will be a bit more "interesting." Kaz is one of my absolute favorites. 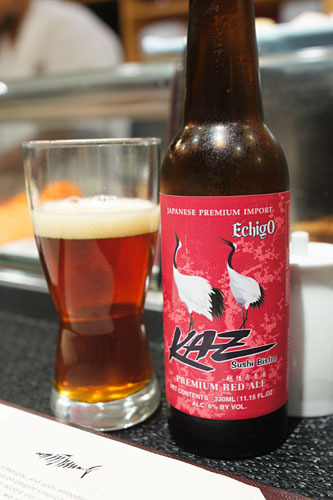 I don't live in DC but when I was traveling there frequently I'd eat at Kaz every time. Kevin you should also try out Sushi Taro on your next visit. Both the Kaiseki and the Omakase are amazing.